"We saved 1.5 months and $20,000 in development costs by using Iron Speed Designer." The LeadTracker application is a brand-new application that tracks inquiries from prospective customers for large car dealerships. It was developed by Presence Consulting Corporation using Iron Speed Designer. IVRSurveys.com is a leader in the development and deployment of highly customized Interactive Voice Response (IVR) programs for several industries. IVRSurveys.com is most notably known in the market research industry for developing the methodology that collects data on customer satisfaction and customer experience. It then reports that data in real time via the internet. Clients served by IVRSurveys.com include McDonald's, Gatorade, Blue Shield, American Airlines, Arby's Restaurants, Bank One, Best Buy, Circuit City, KFC, and Kmart, among others. Application Edit Page has code overridden to edit record on Page_Load. LeadTracker's administrative interface is used internally by IVRSurveys.com, but other screens are accessed by the car dealerships themselves. The application alerts car dealerships about new prospects after customers have taken an initial interactive phone survey. The application stores all collected information so sales people can follow up and provide information to the prospects. Another business function of the application, using similar technology, helps salespeople target customers for vehicle trade-ins. When people call the toll-free number on the promotional mailer or sales receipt, the Interactive Voice Survey System is activated. It identifies them using the "incentive code" printed on the material. After the survey system collects information about the potential customer, it records the information in the LeadsTracker database. Depending on the configuration of the application, car dealerships may or may not get an email alert. Each car dealership has a designated individual, usually the sales manager, who logs into the application throughout the day to check new leads. 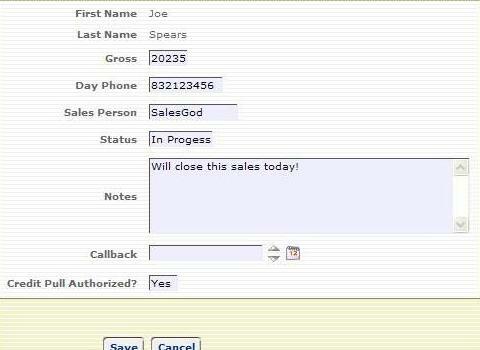 New leads in the system are highlighted so the user knows instantly which sales lead to focus on or arrange a call-back. Once the sales record is viewed or edited, LeadsTracker will automatically flag the record as "read" and takes off the highlighting, similar to the actions in an email inbox. This added feature is extremely helpful for all users when they take a quick glance into the system. 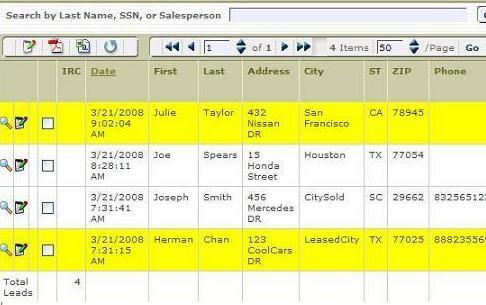 LeadsTracker uses one database, Microsoft Access. There are 11 database tables, of which the tblLeads has the largest number of records. The application contains 25 Web pages. Approximately 300 users per month use the application, and we estimate this comprises 300,000 to 500,000 transactions per month. The project took two months to implement, with a team of 1.5 full-time people. The Iron Speed Designer portion of the project took only 1.5 weeks to complete. Highlighting rows in some ShowTable pages. Populating appropriate Show Table rows. Updating the record automatically on the On Page_Load of EditPage or ViewPage. It only took 2.5 days to write the customized code. We did not use any third-party components, although some may be added in the future. Customized row highlighting in application ShowTable pages. We used the standard Alps design theme in Iron Speed Designer. We saved 1.5 months and $20,000 in development costs by using Iron Speed Designer. Without Iron Speed Designer, the project would have been feasible, but would have taken at least two months, and would have been much more difficult and slower. There are plans to expand LeadTracker to automate more data import and export functionalities so the app could interact with other systems. Another potential extension we are exploring is to provide more management reports in various formats. This would include a delivery mechanism to enhance sales forecasting and performance review. Our major goal is to expand our user base. Herman Chan's technical skill set ranges from Java to .NET, and he works regularly with Oracle and Microsoft SQL Server databases. Previously, he worked as a technical consultant and as a software engineer for a packaged software vendor focusing on the oil and gas industry. Herman also worked as the technical architect for an eLearning company which launched character education modules in over a hundred high schools across the United States. Currently, he is leading and managing various technical projects with a consulting, service-oriented approach.